Monolayer cultures of human fetal retinal pigment epithelial (RPE) cells were examined for ultrastructural characteristics and junctional integrity by means of electron microscopy. Intracellular pH (pHi) and cell volume changes were measured using the fluorescent dye BCECF. The EM studies indicate that the RPE cells preserve in vivo morphology before and after loading with BCECF. Monolayer cultures were placed in a perfusion chamber in which the solution facing the retinal cell membrane could be changed rapidly. Removal of Na+ or the addition of amiloride caused intracellular acidifications. pHi recovery from an NH4 +-induced acid load was blocked by sodium removal or amiloride addition. These results suggest the presence of a Na+–H+ exchange mechanism in the retinal cell membrane. When Cl- was replaced isotonically by lactate or pyruvate the cells acidified. The intracellular acidifications were saturable, reversibly reduced with the inhibitor probenecid (2 mM), and the lactate-induced acidifications were reversibly inhibited by equimolar concentrations of pyruvate. These results indicate the presence of a H+–lactate cotransport mechanism in the retinal membrane. When Cl– was replaced by lactate the cells not only acidified, they also swelled. 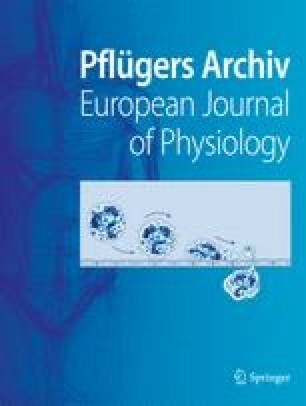 The data are compatible with water transport induced by the H+–lactate cotransporter.